What might be causing that odor in your carpet? Three Main Contributors to your carpet’s odor. Most of us have carpet and enjoy the many benefits it offers. They are soft and comfortable and they add a welcoming touch to our homes. The only downside is, over time things we love can cause odor to accumulate. Below are three reasons why you should have your carpets cleaned to maintain a healthy home! Pets –We love our pets. Unfortunately, our loveable pets sometimes have accidents inside the house. And of course, they don’t usually make it to the hard surfaces but rather hit the carpeted areas. They can also track in all kinds of germs and dirt that get into your carpet and can create an odor. 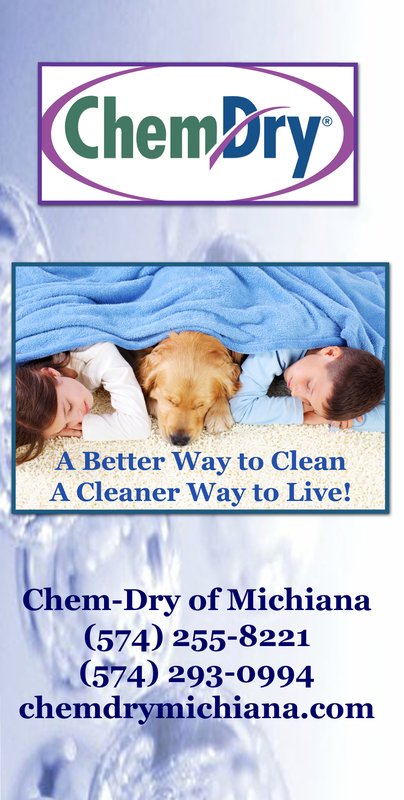 Chem-Dry of Michiana can treat these odors and stains! Food –Food is another factor to consider. We all accidentally loose our grip on food while w e are NOT in the kitchen. If a spill does occur, you should blot the affected area with a dry absorbent cloth right away. A white terry cloth towel is ideal. Be careful not to rub too hard or you could cause abrasion to the carpet fibers. If you act fast, you can minimize the damage by using our World Famous Spot Remover.This is an excellent tool to have on hand for those occasional spills between cleanings. Dampness –Dampness will certainly contribute to that all-too-familiar musty smell in your home. Mold and mildew can actually grow in your carpet when damp conditions exist. Avoid carpet cleaning methods that stay wet for too long. Also, consider running a dehumidifier in damp, humid weather or in a basement that continues to stay damp for long periods of time. At Chem-Dry of Michiana, we believe in a different kind of carpet cleaning. One that’s Drier. Cleaner. Healthier. This means we don’t use soaps, solvents, or other harsh chemicals. Instead, your carpet cleaning will be done with hot carbonated extraction to remove every last odor. To learn more about our green carpet cleaning, call today or visit our website or more information. This entry was posted in Carpet Cleaning, Maintaining a Healthy Home and tagged Carpet Cleaning Elkhart, Carpet Cleaning South Bend, dog urine removal, Flood and Water Damage, South Bend Water Restoration, water damage restoration. Bookmark the permalink.